I have a razor tool that lets me create a ZigZag shape in the glass, it's a wavy razor that I use to "cut" into the glass whilst it's very soft, almost molten, to make patterns. 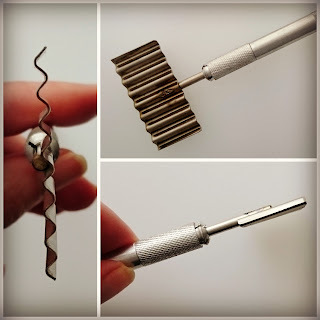 Razor tools are probably one of my favourite tools to use in glass, I have 3! On this bead, I've used the zigzag tool to create one type of effect - a pattern beneath transparent glass that you can almost see through into the layers. You can use the tool in a number of ways; but this is one of my favourites! Well dear readers and A to Z visitors - this is the last of my A to Z posts on My Glass Beadmaking Journey - I hope you've enjoyed a peek into my own glassy world! P.S. This is also the 400th post on Curling Stones for Lego People, at the 100ths I tend to mark the occasion by writing something a bit more personal or special in some way... so it feels very fitting that this one marks my story to you about my own glass journey from A to Z. What will you do next, now the A to Z Challenge is finished? P.S. Don't forget to come back for the A to Z Reflections Post on 9th May! It's been fun learning about glass beads and your passion for them - I admire your talent. Thank you and back at ya on your Murder Mystery! Yay for finishing the AtoZ :) I have very much enjoyed hearing all about your bead making - I never knew how complex and delicate and art it it. That looks like a very useful tool and you've inspired me to learn more about lass beads. Thanks for playing. I enjoyed it so much. Thanks Kathleen, it's surprising what you end up with as a favorite tool! Congratulations on completing the A to Z Challenge -- it's been a blast and I'm so glad I found your blog in and amongst the hundreds of other! Thanks, so glad it's a Bank Holiday weekend here in the UK, an extra day to recover! I'm so glad that you decided to do the A to Z challenge this year, and particularly excited to see some of the behind the scenes details about glass beadmaking! :) It has been so interesting following along. Thanks Tracy, it's partly thanks to you and your encouragement that tipped the scales at the last moment that I did participate as I was so on the edge of leaving it this year and taking a year off. Ditto on your series, it's been so interesting to see where our processes are similar and where they differ, and great that I've had a chance to play with regular clay during the A to Z so it's opened up a whole new possibility for me! Hi Gail, thanks so much for your A to Z, great to be able to see it all from your point of view! I love the zig zag tool effect on your bead - it's beautiful. 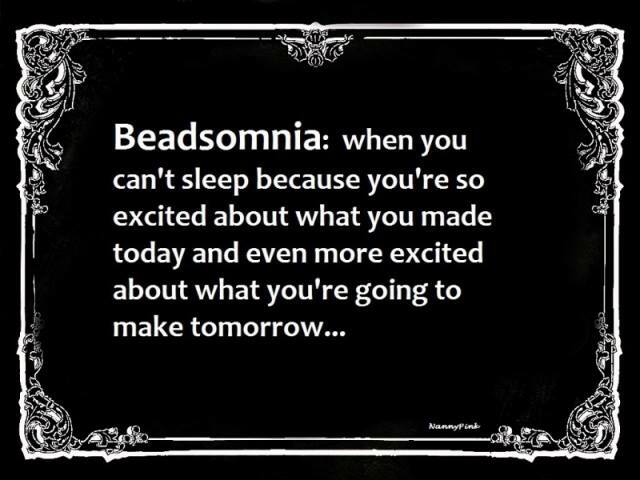 While beads don't cause me 'somnia' I can relate to being excited about the efforts of today and even more excited about what they will bring tomorrow. 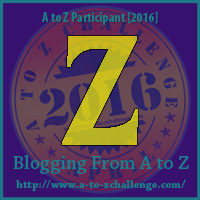 congratulations and well done on completing this year #atozchallenge. 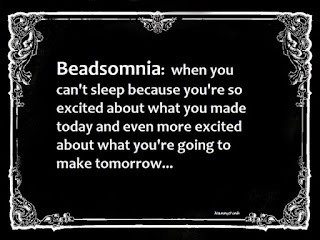 Thanks Ida, congrats on reaching the finish line, I love your last post! This was a wonderful series! I'm just sorry I didn't get to read all the posts—but isn't that what May is for? ;) I'll be back, and often. Congratulations on making it to the finish line! And on the 400th-post celebration, too! Thank you so much Guilie, ditto on the posts, there are quite a few blogs I'll be coming back to in May as I ran out of time to follow all the series that I wanted to! Congratulations on completing the challenge! What an interesting hobby and technique! Thanks Zeljka, congrats to you too!